San Francisco is not only home to some of the country's finest restaurants, we're also home to shockingly inexpensive yet tasty fare as well. Here the best spots in the city to grab a good bite on the cheap. Hands down the best New York-style slice place in the city, Arinell is often mistaken for just another crappy-looking pizza shop like the many across S.F. serving doughy, poorly cooked slabs of mediocrity. The dough is thin, the slices are generous, and the cheese is properly molten and greasy when they pull it out of the oven, and many a Yelp review will confirm that this joint is an oasis for all East Coast transplants who thought they couldn't find such pizza anywhere here. Also, the cheese slices are just $2.50, making them some of the cheapest around too. But beware that the place keeps odd hours, and won't always be open when they're supposed to be. This Mission market harbors a secret: a bahn mi counter that turns out some of the city's heartiest Vietnamese sandwiches. At $5 apiece, these massive sandwiches give you more bang for your buck than almost any other cheap eat, and they're menu of fired chicken or authentic bahn mi never disappoints. One of the better kept secrets of deep Mission denizens is this taco truck, which makes daily appearances just off the 24th Street corridor. For a couple of dollars you can sample some of the finest tacos in the Bay Area, including their signature braised chicharrones taco, the lengua, and their top-notch, expertly-seasoned al pastor. Oh, and they make burritos too. 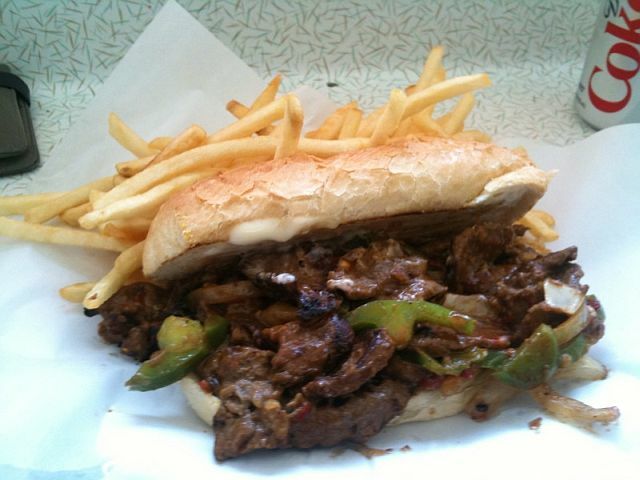 SFist was one of the first to tell you about HRD Coffee Shop and their Mongolian Beef Cheesesteak Sandwich. 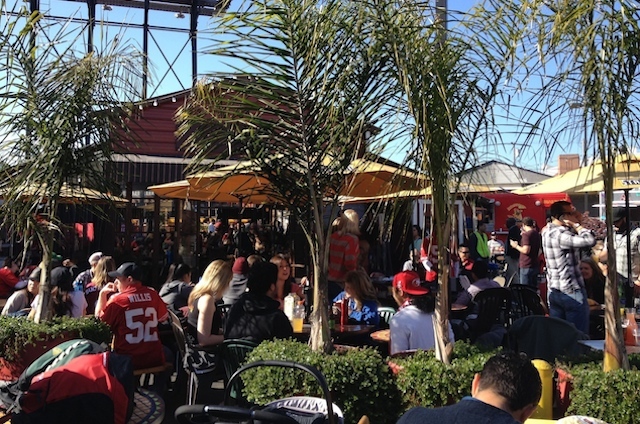 Since then, the little Third Street diner has skyrocketed to Food Network fame and long lines (as well as scoring a second location in North Beach). But above it all, the place runs on great cheap food -- ranging form classic American fare to Chinese favorites -- and friendly service. For a mere four bucks, your adopted Tía and Abuelita at Los Panchos will gladly serve you a double order of basic pupusas: beans, cheese and a choice of meat, with a healthy side of vinegary curtido cabbage slaw. Spring for the rice and beans for an extra $3 and you'll be taking half your order home with you. When you really feel like going nuts, order the pupusas locas — super-sized versions of the Salvadoreño specialty with cheese, beans, pork, chicharrones and jalapeños. Best of all: they're open until 4 a.m. on the weekends. Rosamunde elevates your typical meat-in-a-bun fare to heights of deliciousness unattainable for your typical hot dog. Try the knockwurst, andouille, lamb or wild boar sausages, then pile your toasted bun high with sourkraut, onions and spicy brown mustard. For only $6-$6.50, it's a step above street food for a price that'll leave room in your wallet for a beer or three. When you're around the Tenderloin on any given afternoon wondering what that line is all about on Larkin near Eddy, it's this place. Why the line? Because their simple but perfect banh mi sandwiches ($3.25 to $3.75) are one of the best deals in town. And don't settle for the various imitators within a few blocks near Little Saigon; Saigon's banh mi have delicious, juicy meat, terrific pickled vegetables, and fresh, crunchy French rolls with a smear of mayo. And we recommend the Thit Cha which comes with a combo of pork and paté. What can be said about the Inner Sunset's San Tung other than OMG WE CAN'T GET ENOUGH. The wait is long and the service is appalling, yes. (We'll take San Tung's line and attitude any day of the week over the pretentious Mission queues, thank you.) And it has its fair share of detractors. But the food is cheap, crazy-good, and plentiful. Our favorite dish? 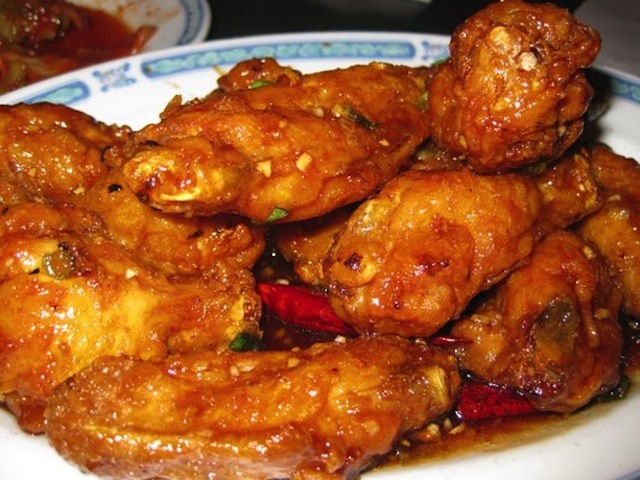 The dry fried chicken wings. Among so many. Another Tenderloin mainstay, Shalimar is a well known secret among the Chowhound crowd. In this truly divey, fluorescent-lit, bordering-on-unpleasant setting you can eat some of the best tasting North Indian and Pakistani dishes in town. And the prices are pretty great, with curries for $6.95, and delicacies like the goat karahi for under ten bucks. Also, they serve some of the best spiced vegetarian stuff you'll find anywhere. This massive spot at the nexus of SOMA and the Mission corrals some of the city's finest food trucks into one picnic area (free wi-fi, too!) with benches, trees, freeway overpasses, and some of the cheapest fare in town. - Mission Chinese Food - Obviously. - Ali Baba's Cave - Great falafel. - Truly Mediterranean - Excellent shawerma. - Mario's Bohemian Cigar Store Cafe - Run, don't walk, for their amazing meatball sandwich on fresh focaccia. - Taqueria Cancun - Our personal favorite al pastor burrito is here, with the 6th and Market location slightly better, maybe, than the Mission one. - Turtle Tower - Often regarded as some of the best Vietnamese around, with a couple locations. - The Creme Brulee Cart/Window - Cheap(ish) and delicious desserts with nicely torched tops. Jay Barmann, Andrew Dalton, Rose Garrett, and Brock Keeling all contributed to this article.